Medical Home Community Forum archived Webinars are now Available! 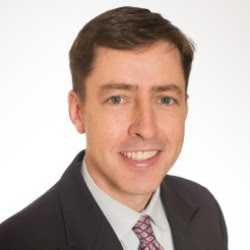 Colorado Medical Home Community Forum: The forum is focused on integrated care and is a collaborative effort coordinated by the CO Department of public health and Environment and the CO Department of Health Care Policy and Financing to promote a medical home approach in Colorado. Stakeholders represent various agencies, families, medical facilities, Regional Care Collaborative Organizations, and policymakers from all over Colorado. Serves as a resource for people and organizations committed to a medical home model that strengthens the delivery of care in Colorado. Subscribe to receive email alerts for upcoming quarterly Medical Home Community Forum meetings. 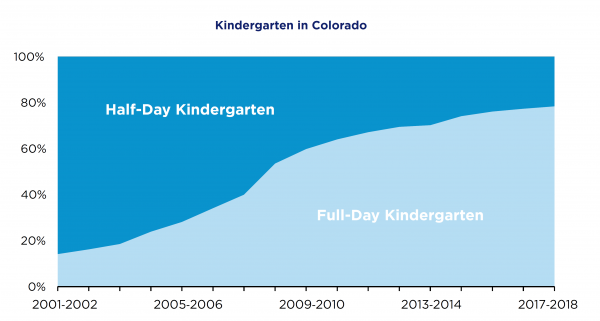 Check out the article below from our partners at Colorado Children's Campaign about what it would mean if Colorado funded full-day kindergarten, an issue also prioritized by the Colorado Child Fatality Prevention System as an upstream strategy to reduce stress among parents and caregivers and improve family health. This position will work closely with the Colorado Department of Transportation and will actively participate in statewide coalitions related to teen driving, impaired driving and injury prevention. Qualified candidates should have experience engaging diverse partners to achieve program goals, conducting program evaluation, and providing training on injury and violence prevention or similar topics. The job posting will close on January 22, 2019 or when 30 qualified applications have been received. • How can systems enhance current injury prevention work? • What are the tools and methods available to do systems thinking work? • What does it look like when we use a systems approach in our practice settings? After the webinar, for those interested in taking a deeper dive, information about joining a learning community will be provided to registered participants. The presentation will be recorded and available to those who are unable to participate live. 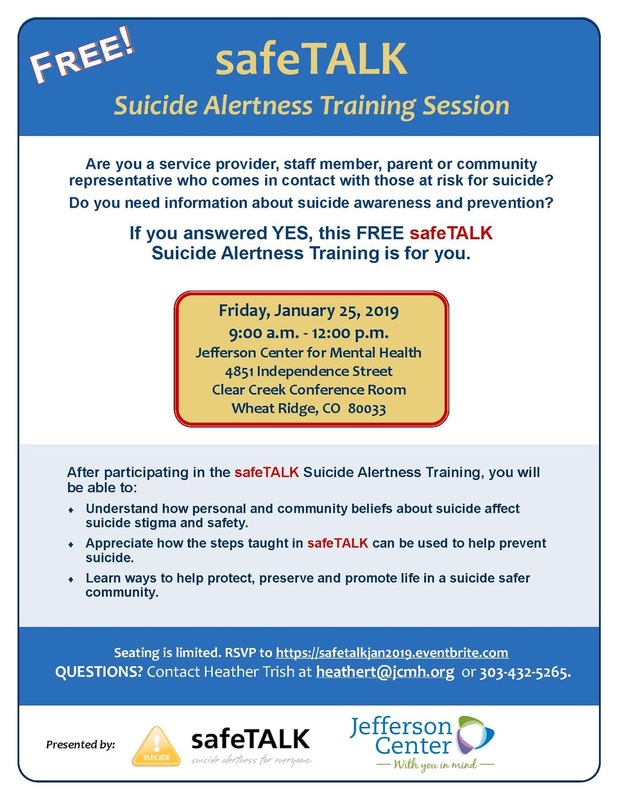 The safeTALK Suicide Alertness Training is a 3 hour training that deals openly with the stigma around suicide and prepares participants to become more aware of suicide prevention opportunities in their community. As a safeTALK-informed session member, you will be better able to: understand how personal and community beliefs about suicide affect suicide stigma and safety; appreciate how the steps taught in safeTALK can be used to help prevent suicide; choose among ways to help protect, preserve and promote life in a suicide-safer community. 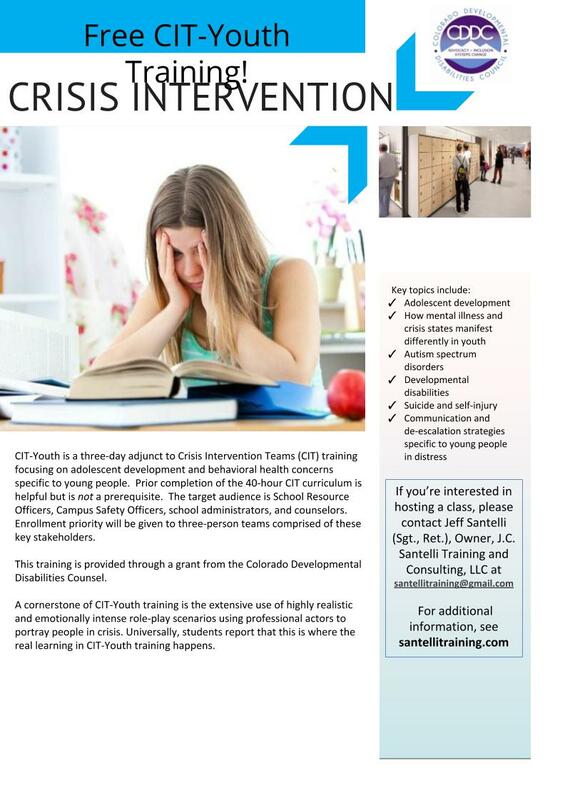 Please feel free to share this informational flyer with anyone who might benefit from this training or be interested in attending. Research shows that primary seat belt laws are the most effective way to reduce traffic fatalities and injuries on public roadways. 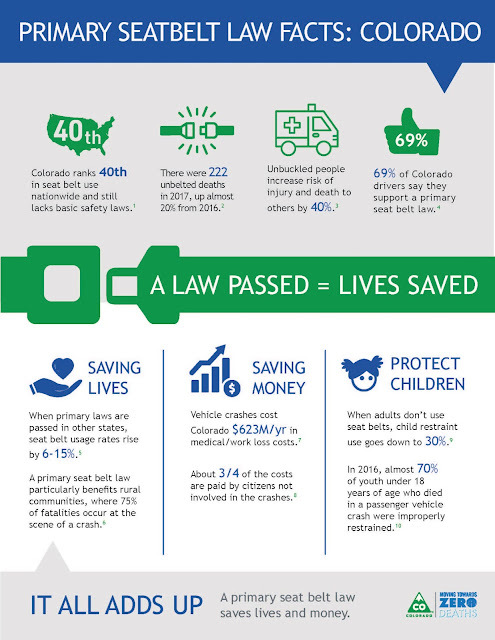 Updating Colorado’s current seat belt law would provide protection for all citizens. That's why it is a legislative recommendation submitted annually to the Colorado General Assembly by the Child Fatality Prevention System and the Colorado Task Force on Drunk and Impaired Driving; and is supported by the Colorado Young Drivers Alliance and the Colorado Occupant Protection Task Force. Traffic safety advocates across the state are educating stakeholders on seat belt use and effective policies to prevent motor vehicle fatalities. To learn more about the communities at highest risk of being seriously injured or killed in an unrestrained motor vehicle crash, how Colorado currently addresses this issue, and to access additional traffic safety advocate resources, contact Ginna Jones, Motor Vehicle Safety Manager at ginna.jones@state.co.us. Click the fact sheet below to download for educating stakeholders on motor vehicle safety best practices. OPPORTUNITY The Healthy People 2030 public comment period is now open! The opportunity for public comment on the Healthy People 2030 objectives is now open . You are a group with much to offer! Healthy People focuses on critical health promotion and disease prevention topics. Since its launch in 1979, the initiative has grown substantially—increasing from 226 objectives in 15 topic areas for Healthy People 1990 to more than 1,200 objectives in 42 topic areas for Healthy People 2020. Because stakeholders have indicated a desire for a more specific and targeted initiative in the next decade, Healthy People 2030 will be a streamlined set of national health objectives guiding the Nation in efforts to improve health. While this translates to a smaller set of objectives, Heathy People 2030 will continue to represent critical public health priorities by addressing the leading causes of morbidity and mortality and driving action at the national, state, and local levels. In response to stakeholder input, Healthy People 2030 will include a streamlined set of national health objectives to guide the Nation’s efforts to improve health. Healthy People 2030 will continue to represent critical public health priorities by addressing the leading causes of morbidity and mortality and driving action at the national, state, and local levels. Why do we recognize National Impaired Driving Prevention Month?In an average year, 30 million Americans drive drunk, and 10 million Americans drive impaired by illicit drugs. All 50 States and the District of Columbia enforce the minimum legal drinking age of 21 years. NHTSA asks minors to avoid alcohol, and encourages parents and other caregivers to make a new or renewed commitment to never cater a party to underage drinking. If someone you know is drinking, do not let that person get behind the wheel. If you see an impaired driver on the road, contact law enforcement. Your actions may save someone's life, and inaction could cost a life. Families play an essential part in stopping impaired driving. By talking about the risks and setting clear expectations, parents and other caregivers can help their children stay safe, sober, and focused on the road. Traffic Safety Marketing – a website with free campaign posters, TV/radio/web ads, and other resources, including more about NHTSA’s Buzzed Driving is Drunk Driving and Drive Sober or Get Pulled Over campaigns. (link is external)and Drive Sober or Get Pulled Over campaigns.